Installing an AIS (Automatic Identification System) allowing us to see information (boat name, length, boat type, radio call sign, boat speed & direction) on other boats / ships in our area and for them to see our boat information. Tug'n and Wings "on the hard"
This season, it will be just us aboard Tug’n and Bob and Jan aboard Wings making the trip back to the Great Lakes. 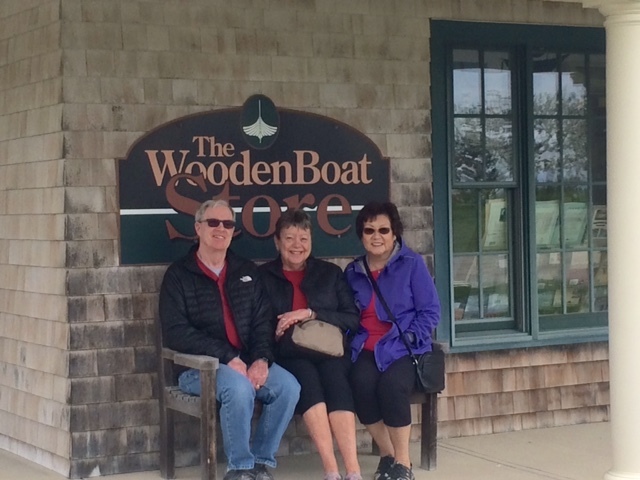 Our friends Dave and Judy aboard Sir Tugley Blue have decided to spend the full 2017 season cruising the coast of Maine and hauling out again at Atlantic Boat Company next winter. Tentatively they will make the return trip to Lake Michigan in 2018. BLOG Comments and Feedback: Last year, many of you tried to leave comments on our various blog postings but were unable to. Thankfully our friends Tim and Bice helped sort out this problem last fall and you are now able to leave comments on the blog. So, we look forward to hearing from you this summer with your comments and questions or to just say hello. Some History of Maine: The history of the area now called Maine spans thousands of years. The earliest inhabitants called the Red Paint People (3,000 BC to about 1,000 BC) were a maritime group known for elaborate burials using red ochre. They were followed by the Susquehanna Culture, the first to use pottery. By the time the Europeans arrived in about 1525 the inhabitants of Maine were Algonquian speaking Wabanaki peoples including the Abenaki, Passamaquoddy and Penobscots. The first Europeans to explore the coast of Maine sailed under the command of the Portuguese explorer Estevao Gomes in service of the Spanish Empire. They did not settle in the area, but they mapped the coastline. The first European settlement was made on St. Croix Island in 1604 by a French party lead by Samuel de Champlain. 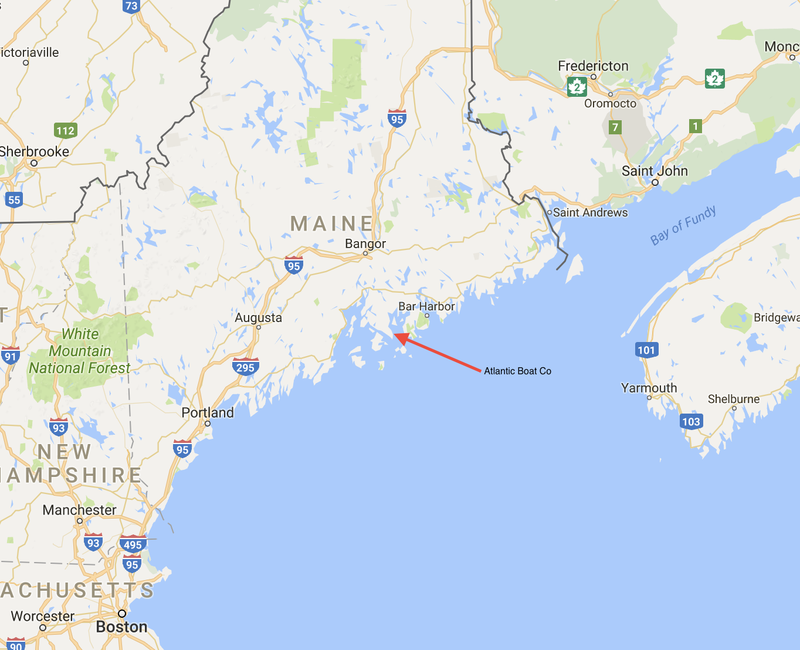 The French named the area Acadia. French & English settlers would contest central Maine until the 1750’s when the French were defeated in the French and Indian War. The French developed and maintained strong relations with the area’s Native American tribes through the Catholic missionaries. During the American Revolution, Maine was a centre of Patriotism, with less Loyalist activity than most colonies. Merchants operated 52 ships that served as Privateers attacking British supply ships. Captain Henry Mowat of the Royal Navy was in charge of operations off the Maine coast during much of the war. He dismantled Fort Pownall at the mouth of the Penobscot River an burned Falmouth (present-day Portland) in 1775. He was reputedly heartless and brutal, but historians note that he performed his duty well and in accordance with the ethics of the era. In 1779 the British started to seize parts of Maine, especially around Penobscot Bay, to make it into a new colony named New Ireland. The approach was promoted by exiled Loyalists so it could become a permanent colony for Loyalists and a base for military action during the war. The plan failed due to lack of interest by the British government and by the determination of the Americans to keep all of Maine. Peace was signed in 1783 and the New Ireland proposal abandoned. In 1784 the British split New Brunswick off from Nova Scotia and made it into the desired Loyalist colony. 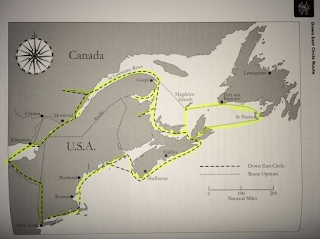 The Treaty of Paris that ended the war was ambiguous about the boundary between Maine an the neighbouring British provinces of New Brunswick and Quebec and this would set the stage for the bloodless Aroostook War a half century later. During the War of 1812, Maine suffered the effects of warfare more than most sections of New England. US Army and Navy resources were concentrating their efforts on the west and few resources were assigned to the Maine region. Eventually sufficient militia mobilizations managed to discourage enemy interventions from the British army and naval forces from nearby Nova Scotia. Maine gained statehood in March 4, 1820 (supported by over 70% of its 24,000 residents) as part of the Missouri Compromise in which free northern states approved the statehood of Missouri as a slave state in exchange for the statehood of Maine as a free state. In this manner, northern representation remained in balance with southern pro-slavery influence in the Senate. Maine’s industrialization was focused on logging, lumber, shipbuilding and a disproportionally large merchant marine to deliver lumber all over the world. Later, the emphasis was on cotton textile mills and textile manufacturing, followed by pulp and paper. Maine’s population includes significant immigration from Ireland, French Canadians from Quebec and New Brunswick and English & Scottish immigrants coming via Canada. There is also a significant group of Somali immigrants from the early 2000’s. In the mid 20th century, the textile industry was relocating to the lower cost American South. Shipbuilding was also in decline and in more recent years, even Maine’s most traditional industries have been threatened; forest conservation efforts diminished logging and pulp & paper; restrictions on fisheries put pressure on coastal communities. Maine attempted to buttress retailing, service industries and tourism resulting in more outlet shopping centres, more state and national parks, increasing the number of visitors enjoying Maines vast unspoiled wilderness. However, since the 1970’s, Maine continues to be the poorest state in all of the USA with its exceptionally high levels of welfare. Cruising Maine’s Coast: Enough history. Maine is reputedly one of the best cruising grounds in the world. It combines the best of broad ocean passages, magnificent rivers, coastal islands and mountains, and even a fjord. Wildlife abounds, as do safe harbours, and apparently you can feel as if you are one of only a few lucky souls out there exploring in your own boat. We plan to find out. The typical cruising season in Maine lasts from the first of July through Labor Day. The days are warm, the nights are cool, and the prevailing southwest winds are light to moderate. So, we are on the early side of that time frame an hoping for better than average weather and temperatures. 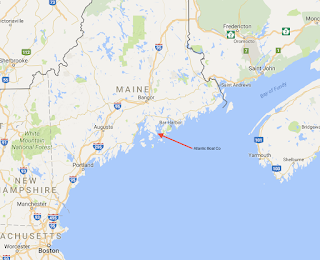 Only 250 miles as the crow flies, Maine’s convoluted coastline measures more than 3,500 miles. A new computerized study using satellite images has logged the length at a whopping 5,500 miles with 6,200 islands. There is enough coast here for a lifetime of cruising. We’ve spent May 29th to June 4th living on the boat at the Atlantic Boat Yard, working away on projects. We made two trips into Blue Hill and Ellsworth with a loner car from Atlantic Boat’s General Manager and literally filled the car twice with groceries and other supplies. We’d planned to launch the boat June 5th and go on a mooring for a day or two to finish checking out our various systems. However, a very high wind forecast for one to two days is making us postpone our launch a little longer. 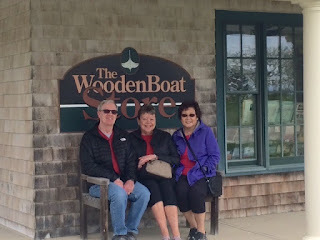 In the meantime we managed to fit in visits to the village of Brooklin with its quaint General Store and Brooklin Inn, the Brooklin Boat Yard and the Wooden Boat School that offers live-in courses on the art of wooden boat building. For anyone considering cruising this area, we give high praise to the Atlantic Boat Company. Their price was the most reasonable we found in this area of Maine and the staff are the most friendly and accommodating you could ever hope for. It’s been a great place to store our boat this past winter. The weather so far has been extremely variable. During one day, we’ve experienced fog, mist, brilliant sunshine, heavy cloud cover with frequent showers, calm winds, strong winds and temperature swings from 9 to 23 degrees C (that’s 48 to 74 degrees F). It’s been some variation of that list every day this week. It seems the best thing to do is enjoy those brief bits of lovely sunshine and warm temperatures when they come and be prepared to put your sweater and jacket back on quickly. Many thanks for following our blog and we certainly look forward to your comments. We will definitely be launched and under way by the time you see our next blog post. Well...you just made my morning by updating the blog. As a former "down Easterner" I really enjoyed the post about the history of Maine. Good job on the AIS.